The Bearded One’s “I-turned-40-this-year-so-I-got-myself-a-baller-mid-life-crisis-bicycle” arrived this week, and he was ready for some geared escapades on the road after being confined to his singlespeed and fixed gear bikes for almost a year. I’m always eager to check out a new route, so I scanned the Grizzly Peak Cyclists’ extensive archive of cue sheets and picked out the Tour of Five Canyons. (I’m a sucker for themed rides.) This is a mellow loop in the Tri-Valley that includes two out-and-back jaunts on quiet country roads with easy, rolling climbs. 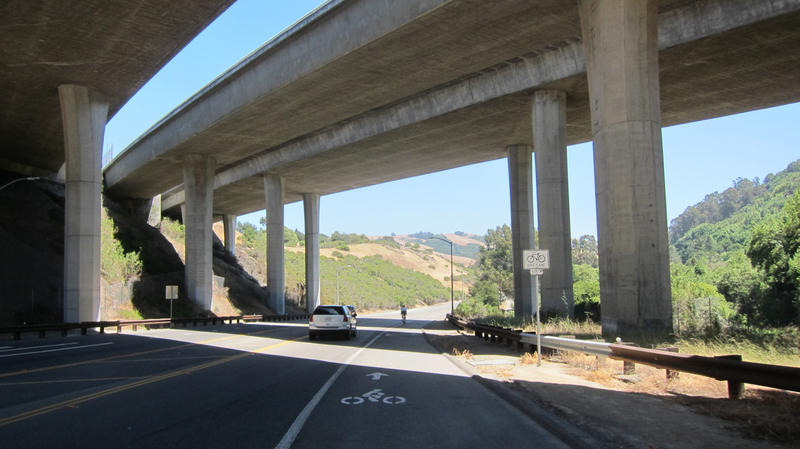 After descending back to Castro Valley Blvd., we were ready for lunch — but first we had to slog through several sweltering miles along the I-580 to reach civilization. Waves of hot air shimmered on the horizon, and TBO was preoccupied with thoughts of cool drinks as we motored along the seemingly endless stretch of road in the scorching afternoon sun. “I want a coconut water. Or maybe a Diet Coke. Or maybe a real Coke. Or maybe a beer. Yeah, beer…” We were ready to melt off of our bikes into warm puddles of sweat along the highway after suffering in the heat for a half-hour. 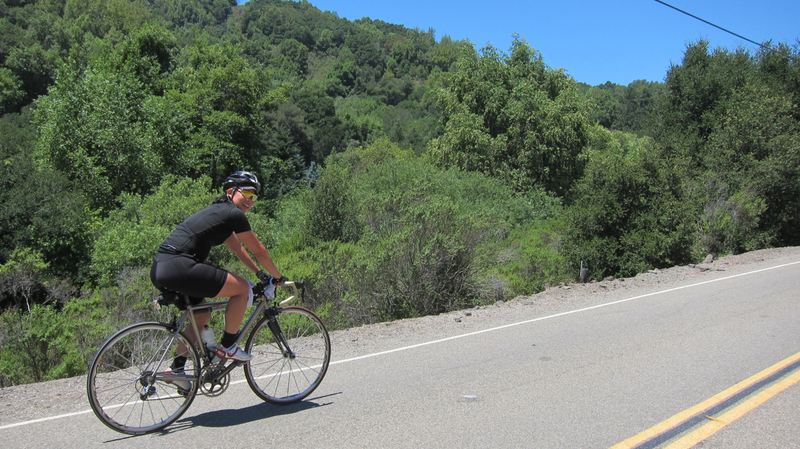 But we were finally rewarded with a cool, shady descent down into Pleasanton for food, and TBO put tons of ice into our water bottles for the final leg of our journey. Our next stop, Bollinger Canyon, took us through the posh neighborhood of San Ramon before transforming into horse ranch territory surrounded by the stark landscape of dry, dusty yellow hills. The road terminates at Las Trampas Regional Wilderness, where we took a shade break before turning back. Norris Canyon splinters off of Bollinger Canyon and was our only semi-grueling climb of the day. 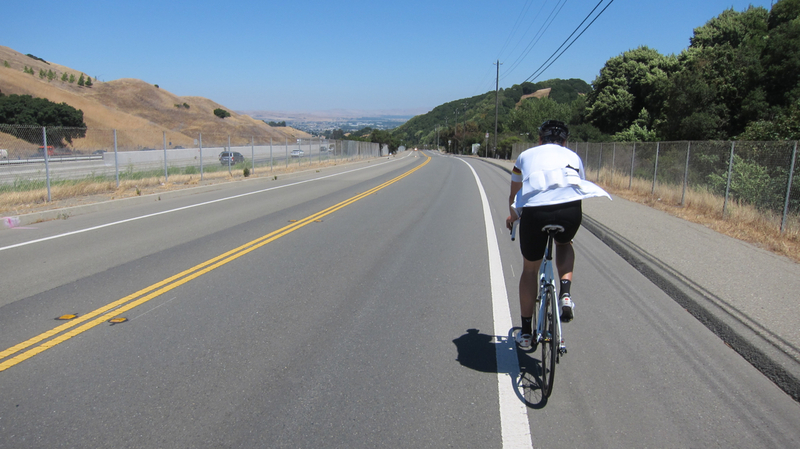 This road crosses the Contra Costa county line and leads to Alameda County, then intersects back to Crow Canyon for a long, smooth descent on fresh pavement back to the nearest BART station in Castro Valley. 75.73 miles / 2482 ft.